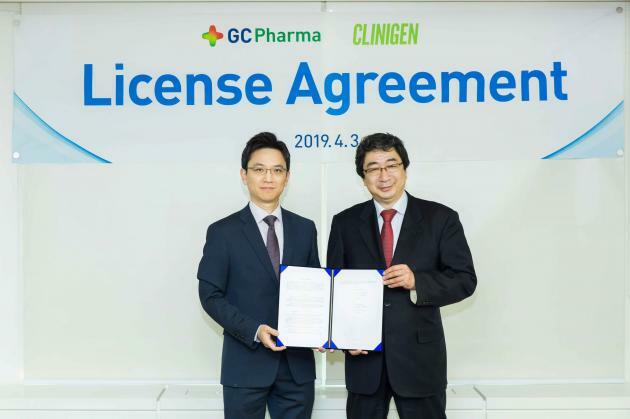 GC said Thursday that it has signed an exclusive licensing agreement to commercialize Hunterase, a Hunter syndrome therapy, with Clinigen K.K., a Japanese-based drug company. Developed by GC, Hunterase is a human recombinant iduronate-2-sulfatase (IDS) enzyme replacement therapy for treating Hunter syndrome. The company is marketing the product in more than 10 countries. The intracerebroventricular (ICV) injection method developed by GC delivers the drug directly to cerebral ventricles, which in turn, reaches the cells of the brain and central nervous system. Hunter syndrome (Mucopolysaccharidosis type II) is an inherited lysosomal storage disease that occurs primarily in boys. It causes an enzyme deficiency that interferes with the body’s ability to break down certain complex sugars, resulting in serious skeletal, tissue, neurological and multi-organ complications and, ultimately, death. The company expects Hunterase ICV will meet the unmet needs of severe patients in improving their quality of life, as a method that can achieve what previous intravenous injection could not. Phase 1 and 2 clinical trials, led by Professor Torayuki Okuyama at the National Center for Child Health and Development in Japan, showed a significant decrease in Heparan sulfate which causes mental retardation.